Hungarian groove metal band Ektomorf has been around since 1994. They have been busy from the start, with the result of nine studio albums and one live record to date. I have been following their career more or less regularly since the late Nineties, and while I was quite pleased with Ektomorf and What Doesn’t Kill Me, I Scream Up To The Sky never really became one of my favourites. The band has often been compared to Sepultura and Soulfly, due to the fact that they also have been combining their roots (in their case: Romani music) with brutal metal. 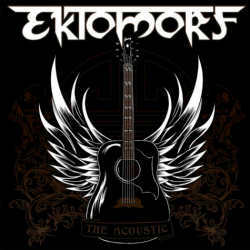 Ektomorf’s new album is different from that they have done so far, as they are presenting a dozen acoustic tracks which can be located in three different categories: five old tracks, five new tracks and two cover versions make up the set list of The Acoustic. On the band’s last album Redemption was already one acoustic song (My Sea Of Misery), which must have given them appetite for more. I have liked the new album from the start. The opener I Know Them is a dragging, dark piece that should appeal to fans of Johnny Cash. Therefore it is no surprise that the band has also covered the Man in Black’s legendary Folsom Prison Blues. The other cover version also has its roots in the country genre. It’s Lynyrd Skynyrd’s Simple Man, a fantastic ballad and one of the highlights on this CD. Vocalist Zoltan Farkas has still his trademark rough voice, but he has cut back on the growls. One could compare him to Rob Zombi and Mark Lanegan. Extreme moments are hard to find on The Acoustic, and the pace is rather moderate too. It is rather surprising that a Hungarian band has come up with such an authentic sounding Southern rock album. Despite plenty of ballads, there is never a lack of suspense. The Acoustic should be considered a one-off experiment for Ektomorf, as the next album has been announced to be much thrashier again. Let’s hope that the metal fanbase is open-minded enough to appreciate this really well crafted experiment.